The top for my 4-Patch Stacked Posey is now on the pile of "quilts to be quilted". I won't get to any MQing until after Christmas, but it's nice to have some of the tops completed. I have a list of about a dozen or so that I'm going to try to finish in the somewhat near future. Good luck! First I have a couple of grandkid quilts to be made. This is a fun (and very easy) pattern. Making the blocks is quite addicitive. I finally got the quilt of vallor off in this morning's mail. It went to the VA medical center in Canadaiqua, NY. Since this name has Canada in it, assume it must be close to the Canadian border. I'll try to post a picture of it next week, when DH gets camera back to me. For your holiday viewing pleasure. My new quilt. Fabrics are Wintergraphix from In the Beginning by Jason Yenter. 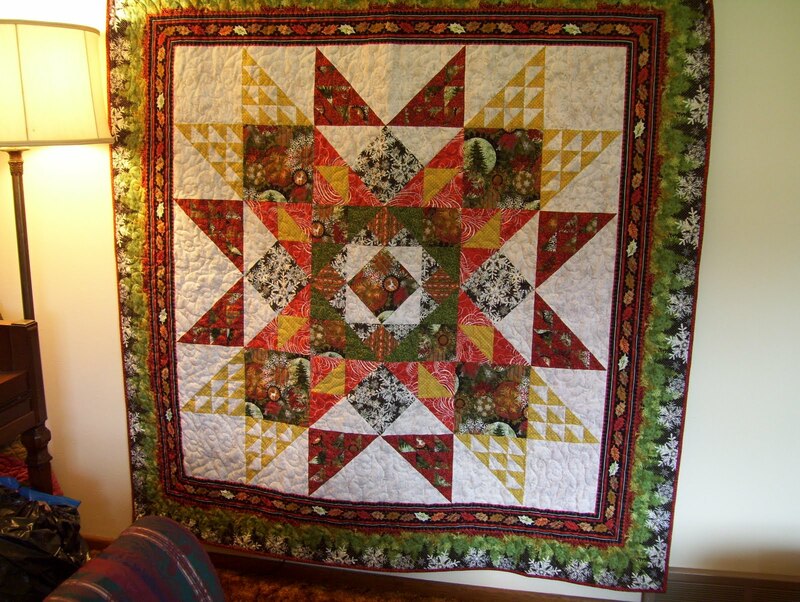 Quilt Inspiration is posting twelve days of Christmas tree quilts. This is a fun quilty blog.